Test run No. 1 from the pattern, successfully completed. It's weird making the applique from a pattern. I usually just eyeball it, but I have to admit that this will streamline the process a vast deal (as Lucy Steele might say). 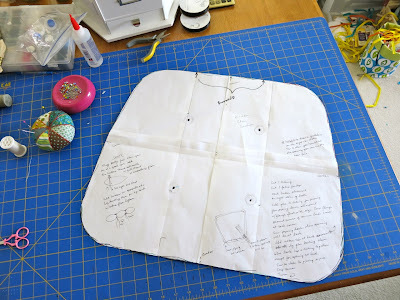 The pattern is written, diagrams done. Mods being made, pieces being tweaked. Many, many words being deleted. I'm always too much with the wordy words on the first draft. 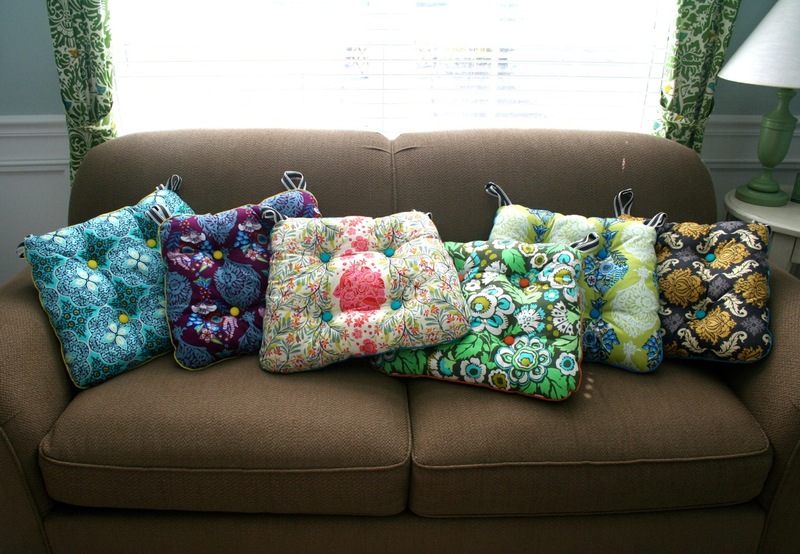 six cushions only took ten years. now you make some. to carefully think about it. I love them. 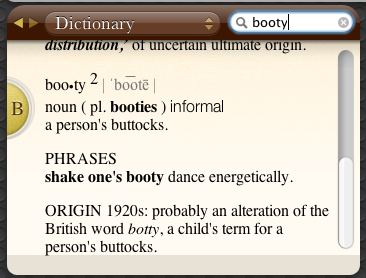 My tush loves them. The girls both said, 'Wow, Mom, our chairs feel so GOOD now.' Poor kids. Looking on the bright side, I guess sitting on hard chairs may have built some character along the way. The chairs were purchased about ten years ago from Crate & Barrel and they are, in fact, pretty booty-friendly, even without the cushions. But it was time. and conservative black ticking on the other. I guess that kind of makes them the mullet of chair cushions. As you can see, I find it helpful to make construction notes to myself directly on the pattern as I go. That way if I use the pattern again I can avoid all the really goofy mistakes I made the first go round. 1) Measure the width and depth of your chair seats and make a drawing on freezer or craft paper from your measurements. Add about an inch all round to compensate for the stuffing. 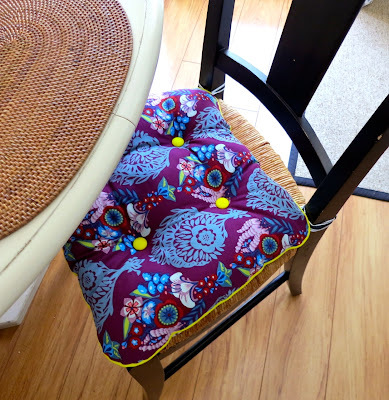 You'll also need to add the 3/8 inch seam allowance (which is the same size as the flange on the piping to keep things simple for the cushion seam, but you'll use 1/2 inch allowance for the straps). 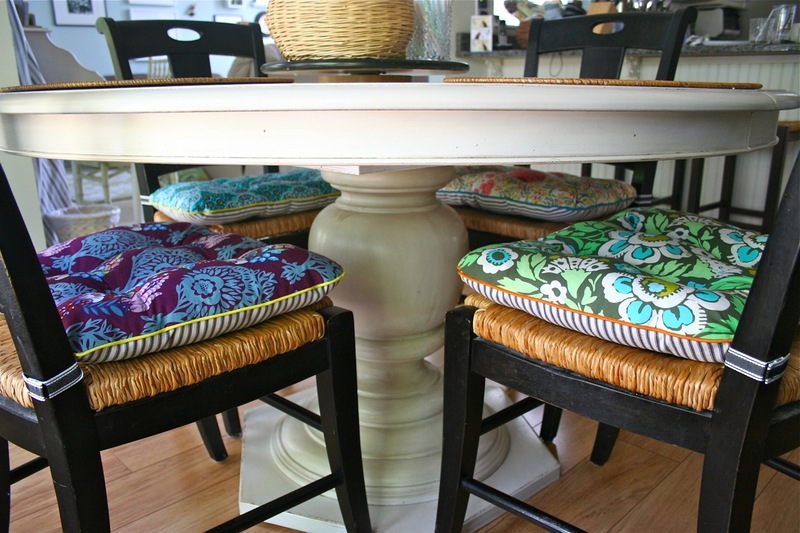 Round your corners using a jar lid or coffee cup to trace around. Now curve the straight sides slightly. 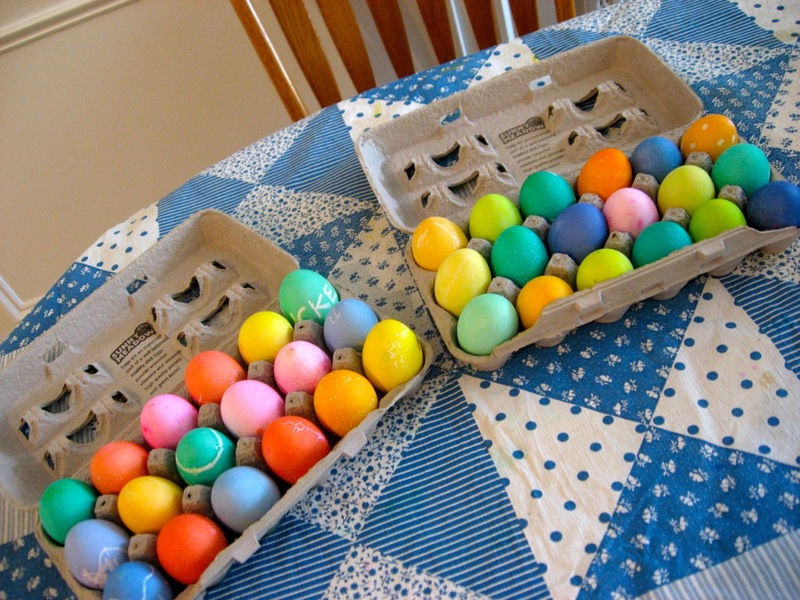 I'm adding this in because I didn't do it with mine and I wish I had. 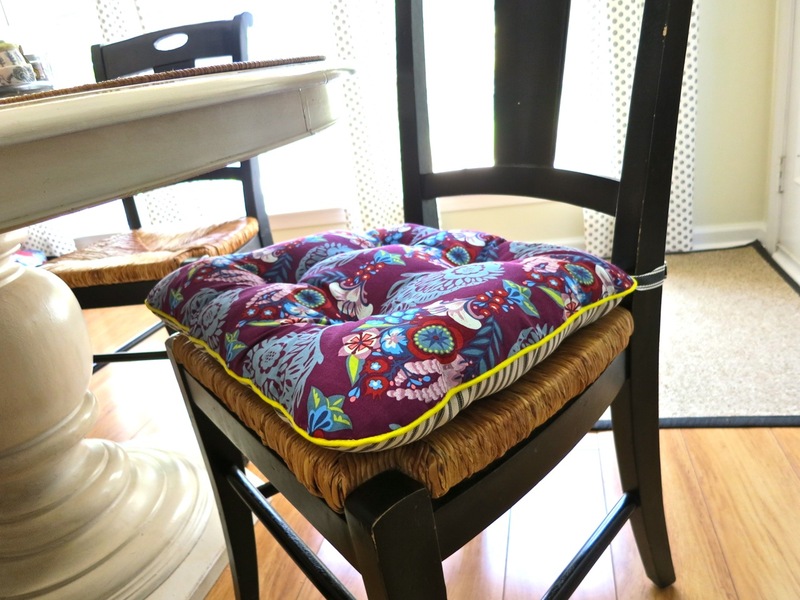 Reason: after you stuff them, the cushion sides pull inward a bit. So you will do a better job than me. 3) Go ahead and make a test cushion or two with cheap fabric or muslin in order to test the pattern and make any adjustments. 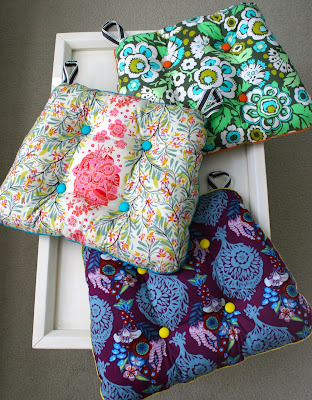 Just skip adding the piping and actual buttons, but it's a good idea to test your straps. 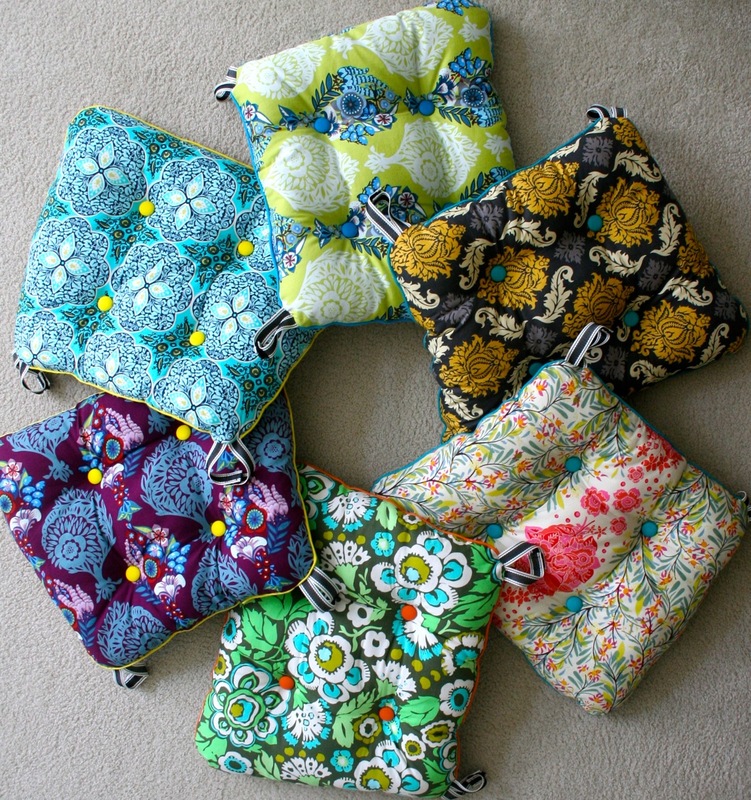 You'll still tuft the cushion, just without buttons, making the knots with the floss. 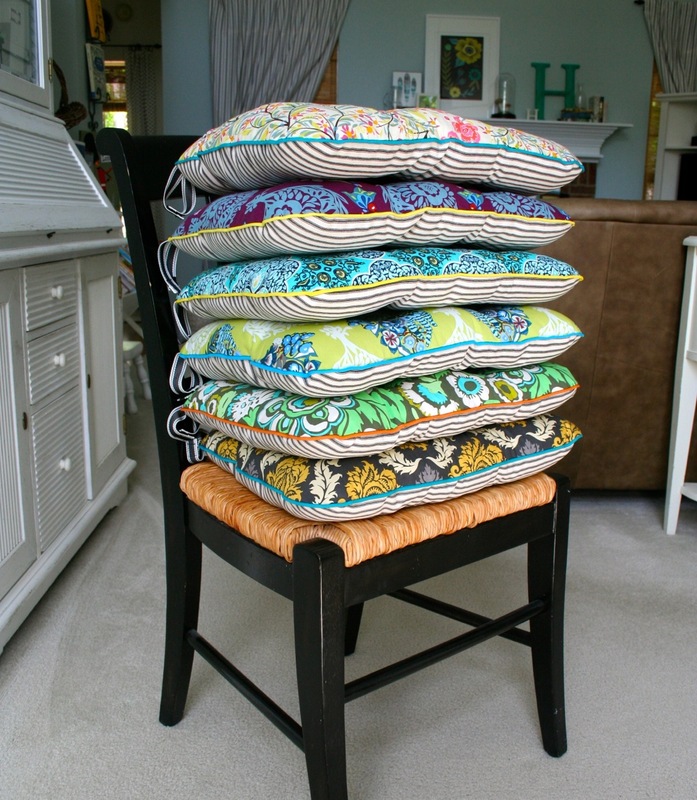 Try the test cushion on your chair and tweak your pattern as needed. Eight self-cover buttons for each cushion you make. I used 7/8 inch buttons on mine. One-inch wide cotton webbing or ribbon for the straps. I used about 20 inches per cushion (four 5-inch pieces), but that will vary for you because your chairs are different. Bags o' stuffing. I used 2 1/2 large bags (32 oz) of Polyfil stuffing for six cushions, and I probably err on the understuffed side. I really hate to stuff things. Late note: I ended up adding more stuffing after we sat on them for a few months, so stuff them as tightly as you can. *** Late Note *** After some real-life road testing, I've found it's probably better to use a longer piece of velcro (as opposed to a square) unless your house contains only small, waif-like adults who do not squirm and fidget. 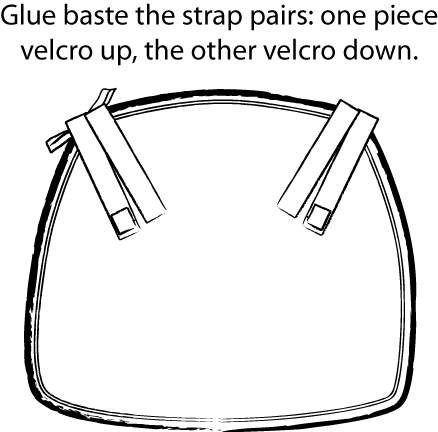 Otherwise, a longer piece of velcro with more overlap will provide a more secure fastening. 6) To make the straps, press over 1/2 inch of one end. Tack with a dot of glue, then sew the velcro square rectangle so that it covers the cut edge. 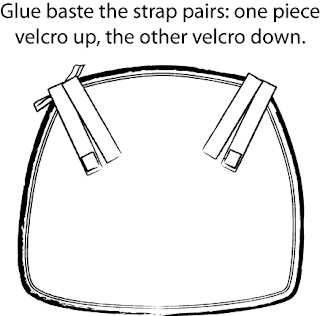 The picture shows a short piece of velcro, but you are going to use a longer piece because you are smart. You'll have four straps for one cushion. Two with the fuzzy side, two with the hooky side. 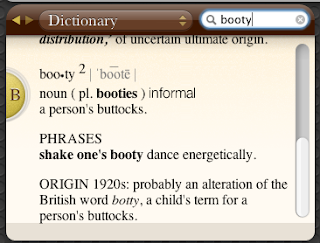 Hooky is the technical term. 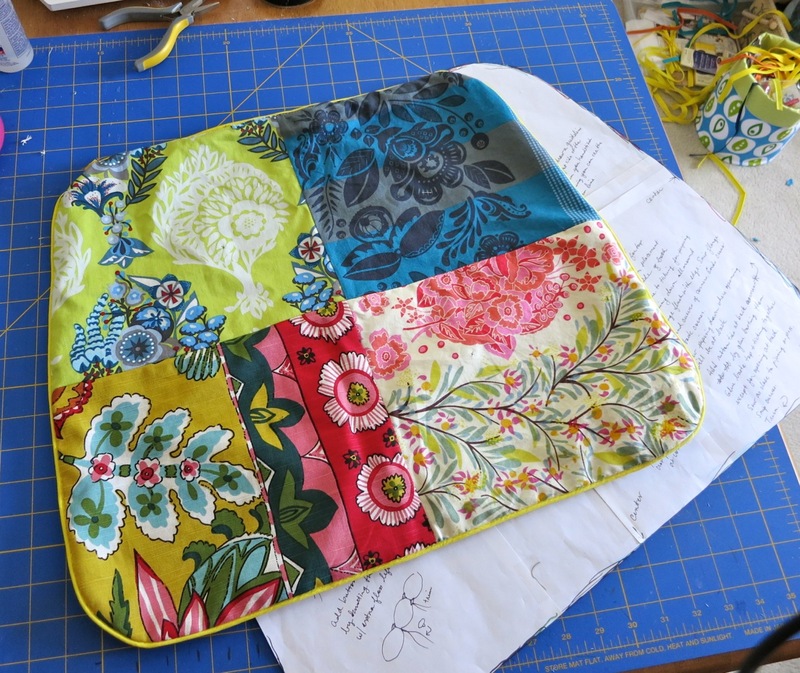 7) Trace and cut out two pieces of fabric for each cushion from your pattern and mark the button placement on the right sides. 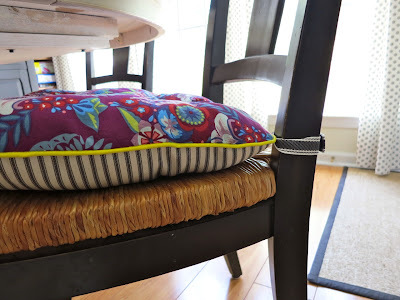 8) Glue baste the piping round the edges of one of the cushion halves (see this post for glue basting instructions: Four Leaf pillow tutorial) except since you used a 3/8" seam allowance you can glue the piping so it is flush with the raw edge of the material. 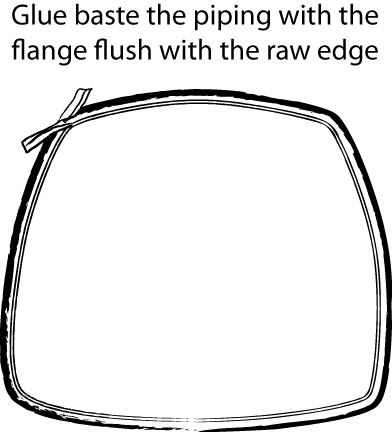 Snipping the flange around the corners makes it easy to curve the piping. 9) Using a zipper foot, sew the piping down just a few inches along the back of the cushion half, so that when you hand sew the opening together later you won't be juggling loose piping as well as two layers of fabric. You can also take this opportunity to sew a corresponding few inches along the seam allowance on the opposite piece of fabric, so you can use that as a guide when you hand stitch it closed later. I highly recommend that. 10) Next, glue baste the straps on with 1/2 inch overlapping the seam line, two straps per corner, one with fuzzy and one with hooky. Make sure that in each corner one strap is basted on with the velcro up and the other with the velcro down - learned that the hard way. 11) Glue-baste the other piece of fabric on top of that, right sides together, leaving an 4 inch opening in the center back so you can stuff it later. Pin around the inward side of the piping for extra security. 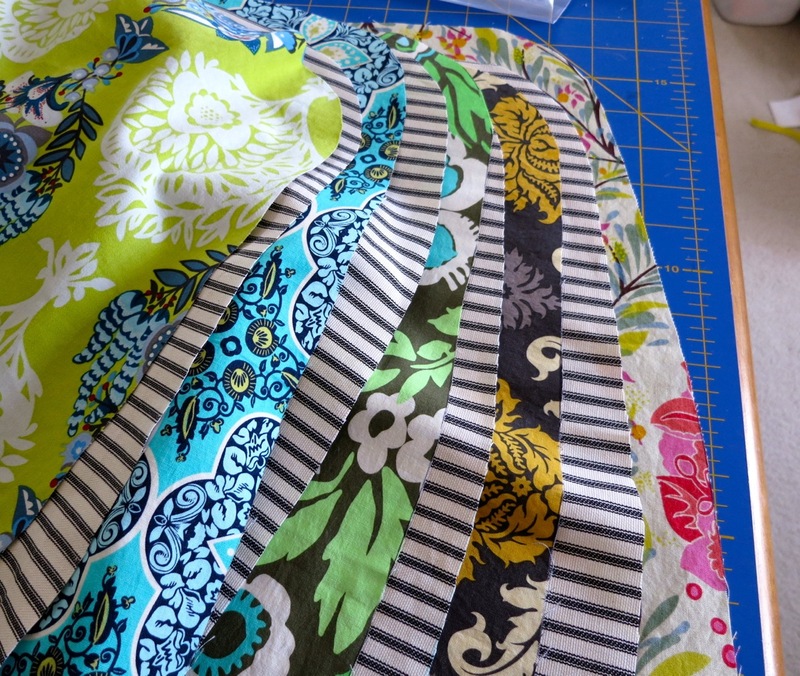 Using your zipper foot, sew as close to the piping as you can, all the way around except for the opening. 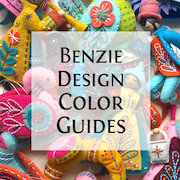 Be sure to backstitch at beginning and end. 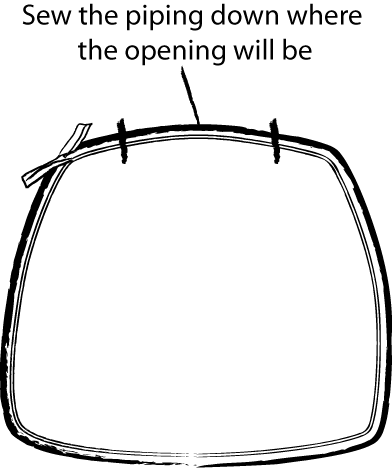 12) Notch the curved corners of the cushion and turn it right side out through the opening. I always love that part. 13) Now set up your iPad on your work surface with Doctor Who Series 2 streaming (that last bit is optional) and stuff and stuff and stuff, until each cushion has a nice shape and is filled out but still pretty spongy. Don't sew it shut. 14) Add the buttons at this point. 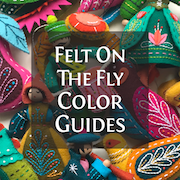 Thread a doll needle with a long piece of embroidery floss, doubled. 15) Go into the pillow at the button mark you made, then out of the pillow at the corresponding mark on the other side. You'll leave a tail of floss out the other side. Don't worry, you are going back to meet it. 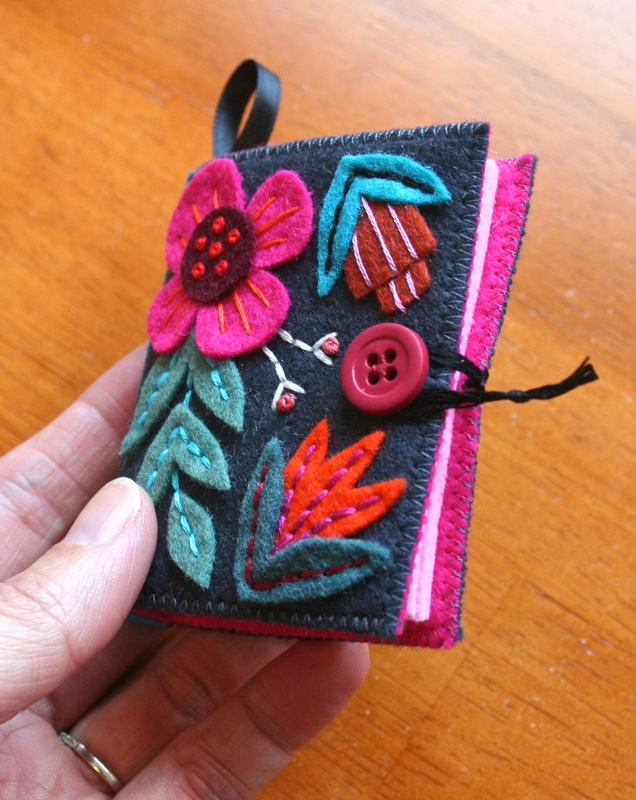 Now thread on a button (which you have already covered in matching fabric, right? ), then go back through the pillow very close to where you just came out, and come out on the opposite side very close to where you came in (see the transparent diagram below). 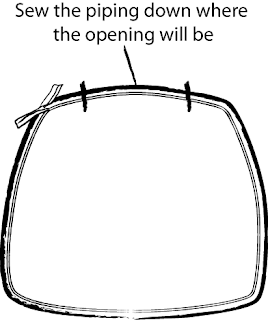 16) Cut off your needle and tie a very tight square knot with the floss, pulling it as tight as you can to create a tuft (see diagram below). Ooh, look at that. It's tufted. Cool. Tie an extra knot for security. Then thread on another button and tie another couple of tight square knots that will disappear under the button as you tighten them. Trim the floss ends so they are hidden under the second button. 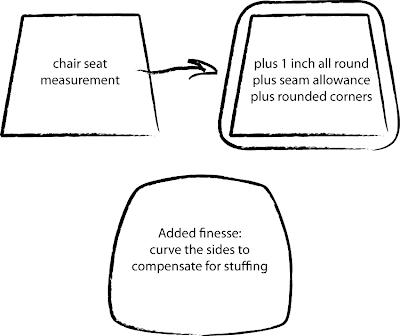 Repeat those steps to add buttons on the other three sets of marks. 17) Now stuff the pillow more and more and more around the buttons until it is just the right shape and firmness all over. 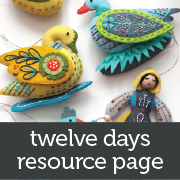 I have learned by experience that when you think it's done, it's time to stuff it more. 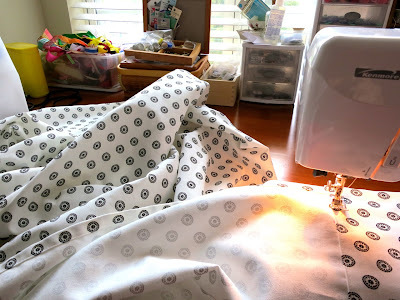 When you are really really done, wrestle the opening shut and pin it with your seam allowance tucked inside (aren't you glad you sewed the guideline there now?) and hand sew the opening closed. Finished! Now go put them on your chairs and sit down a while. 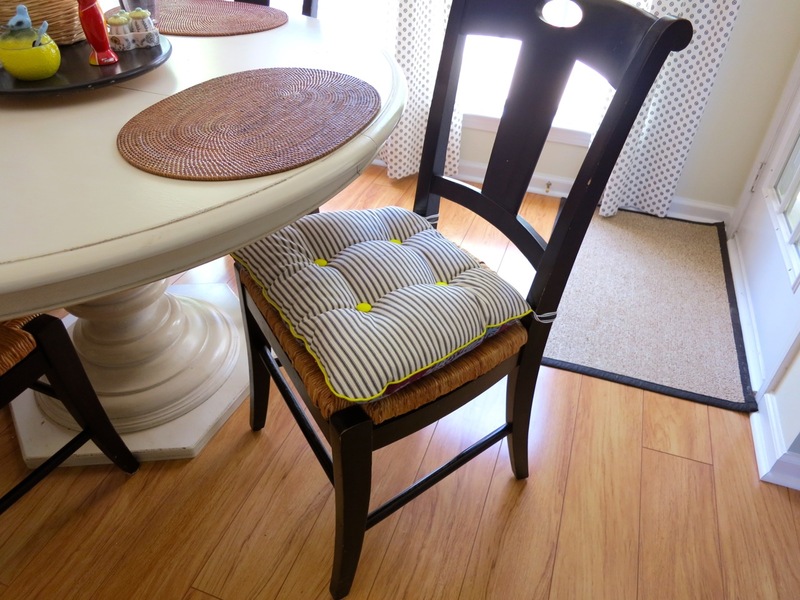 One chair cushion completed and installed. Oh, my. I just super duper love this one. Maybe because it is the one that is finished. Ha ha. Maybe because this AMH fabric is so gorgeous and I'm glad to finally find a use for it. I'm not sure I'm going to love the rest of the cushions and how they will all work together, but it's enough for now to just lovety love this one. I finished the new black and white curtains (you can see them in the background there). They need...something. Like some black trim. Or colored trim. 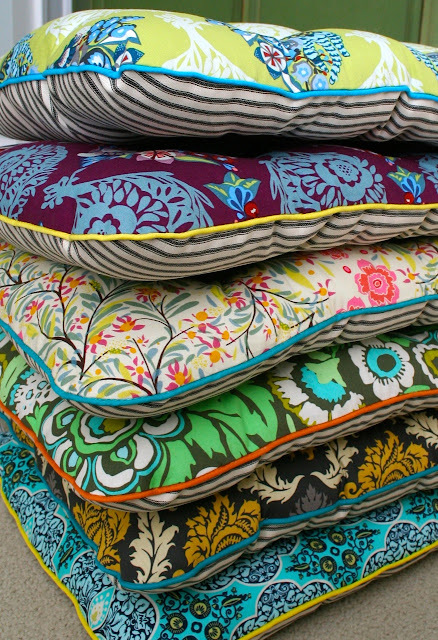 I am tired of thinking about it right now, so I'm making the cushions and then I'll look and ponder again. Do other people do this, I wonder? Stand in their kitchen and squint at their curtains? The other five cushions will also have the black ticking on one side, and piping and buttons. 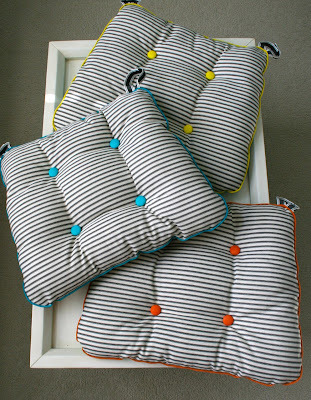 The piping/button color will vary depending on the fabric. I think I will use the same black/white cotton webbing to make all of the loop attachments, which have velcro closures. I just couldn't like the bows. This looks cleaner. Progress is being made. And yes, I touched out the crumbs on my floor. I no longer trust my sense of color so I went with black and white. Failsafe. Right? Thinking of adding some contrast trim along the edges. We'll see if I'm still motivated when I get them hemmed. PRECIOUS. 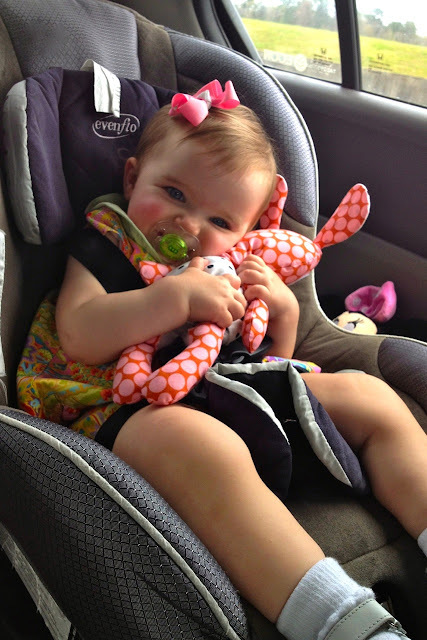 This is my (crazy adorable) 14 mos old great niece hugging her mama-made Baby Binky Bunny. My niece, Erin, worked hard to get it finished for her by Easter. I just had to share the happy, dimply, baby cuteness because this is Monday. Ugh, Monday. Among the other treats were these two bunny mixtapes I made for the girls' Easter baskets of some of their favorite Christian artists. (Like my clever Washi-like patches over their names?) After burning the CDs I wrote their names on the actual CD and an Easter message from Mom and Dad with a Sharpie. I punched one-inch circles for eyes and nose and glued them on the outside of the CD cases, then glued on smaller circles for the middles of the eyes. I added the bunny lips with a Sharpie marker. 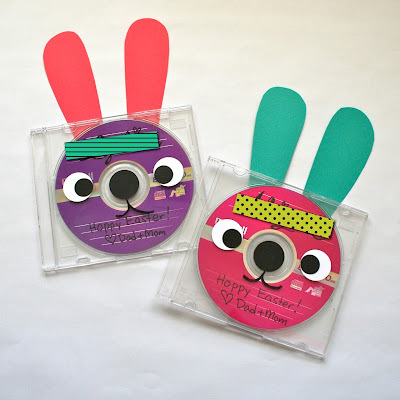 Lastly I cut out two freehand bunny ears from cardstock and glued those to the back of the CD case. We were blessed to spend some time with our extended family this weekend. We colored eggs on Friday, and the sight of PAAS boxes and the smell of the warm white vinegar transported me back to many of my childhood Easters and me patiently waiting my turn with the wire egg dippers and planning my killer color combinations. 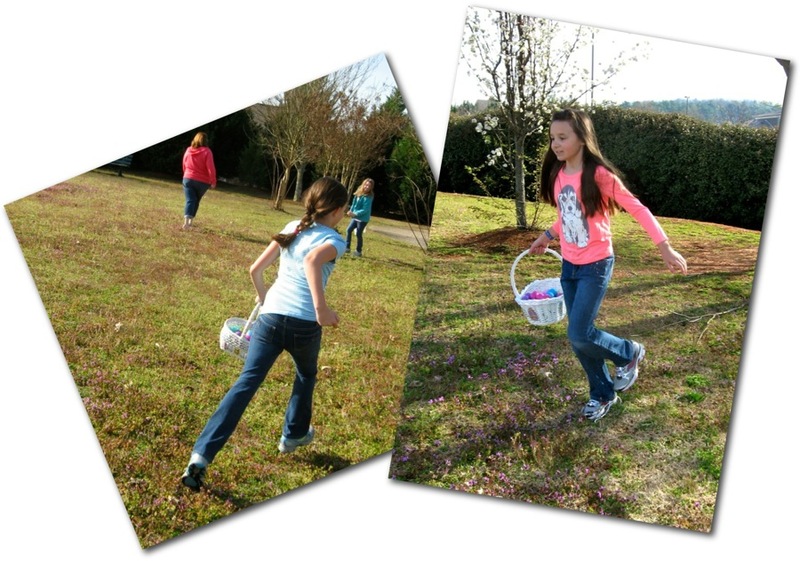 We had beautiful weather on Saturday for the Easter egg hunt, and a lovely cozy family dinner after worship on the rainy Easter Sunday. I hope yours was blessed with love and family too.